During the ski season I’ve said it often: “You don’t know ’til you go.” But last week — after Memorial Day and before the first heat wave of the summer season — wasn’t one of those times. Not exactly. 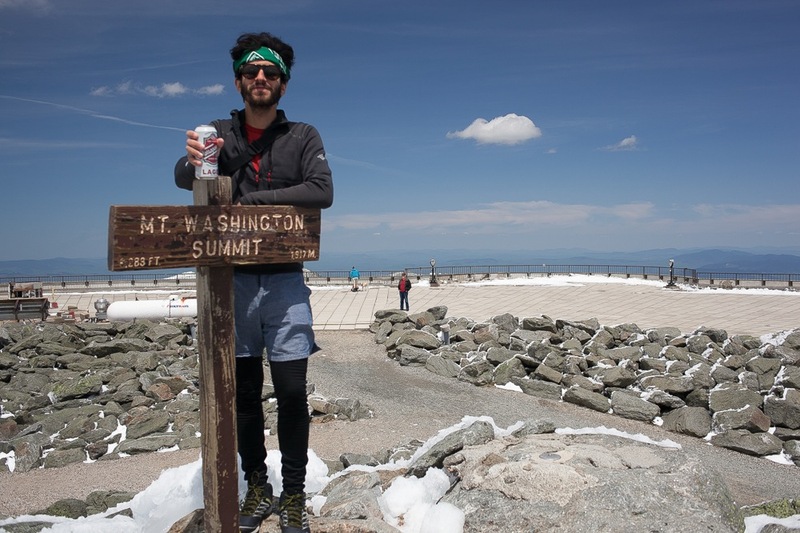 You see, I’d been watching the weather closely and was really optimistic about the skiing on Mount Washington. The Memorial Day snowfall closed the auto road on Saturday and reduced skier traffic in the ravine to those willing to come up via the trail. But snow conditions were only one part of my calculation. The time had arrived to introduce my girlfriend to the pleasures of “backcountry skiing.” Note the quotes; I had no intention of hiking up the Tuckerman Ravine Trail with her. She hates hiking. Or more accurately, she hates it after five miles. And she would definitely hate me, the hike, and life in general, if I had pushed her up to Hojo’s with skis and boots on her back. So, I did what any sane man would do, plunking down the $30 to drive her to the top to shred the remaining patch on the East Side Snowfields. Although I was eager to get down to business, I had the decency to pretend it was a cultural trip. We started our tour of the historical site at the Tip Top House, the only remaining old structure on the summit, originally constructed in 1852. It was a hostel of sorts and housed a printing press, and moving right along let’s see the rest so we can go skiing. Girlfriend not amused. I couldn’t contain my enthusiasm any longer. I moved the car as close as possible to the snowfield, and threw two pair of skis on my shoulders. After a brief portage, we arrived to see a total of three other skiers occupying the fun zone. 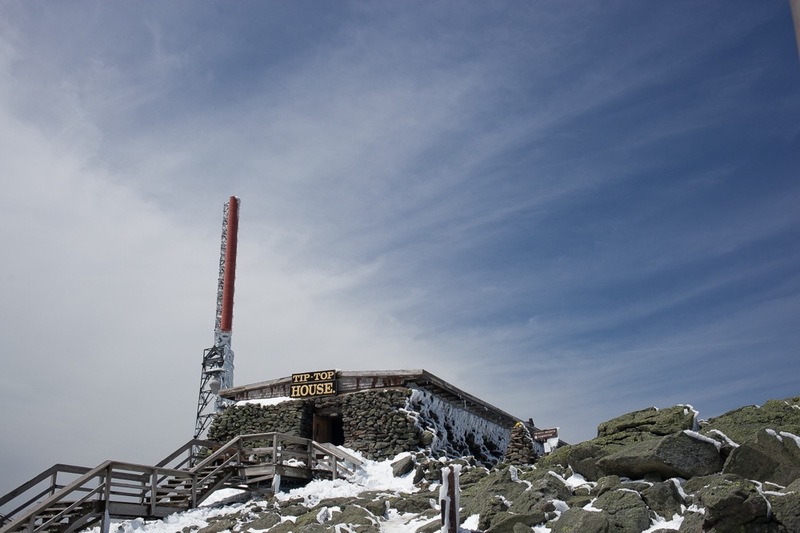 Two of the spectators were an older couple that were extremely excited to watch Amy’s first time on Mount Washington. Would it end up in success or with (my) blood on the slope? Oddly enough, standing at the top of that 400-foot section, it seemed an awfully lot steeper than I had remembered it during my first circumnavigation a few years ago. Thirty degrees is simply much steeper when you’re concerned about someone else. After smearing a few turns to show her that there were no crevasses, ice, dragons, or other dangers, she made a few cautious turns. I had my proud dad moment: her smile said it all even though she didn’t want to admit to having a good time. No one would ever confuse me for a PSIA-rated instructor, but I think the effort was well worth it. As a confidence boosting exercise this was bound to make the headwall on Belleayre’s Upper Yahoo look easier. Regardless, she was done after a single lap. 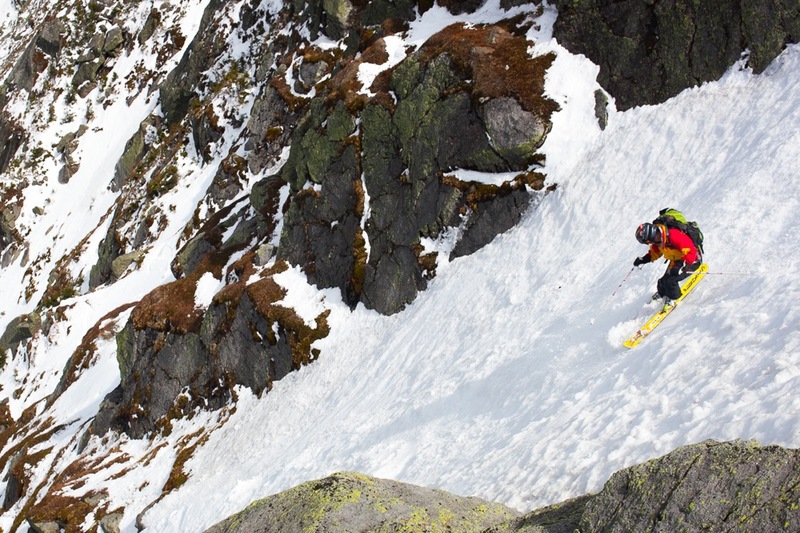 VT-Freeheel and I were super motivated to take advantage of a remaining couloir in the Great Gulf. Hiking along the rockpile, we weren’t totally sure that the line remained unbroken. The snow was soft in the late May sun, and we took turns leading each other down. Some turns were piled with the Memorial Day snow while others were bereft of anything save glare ice. At the crux, we threaded the rocky needle with just a few feet to spare on either side. 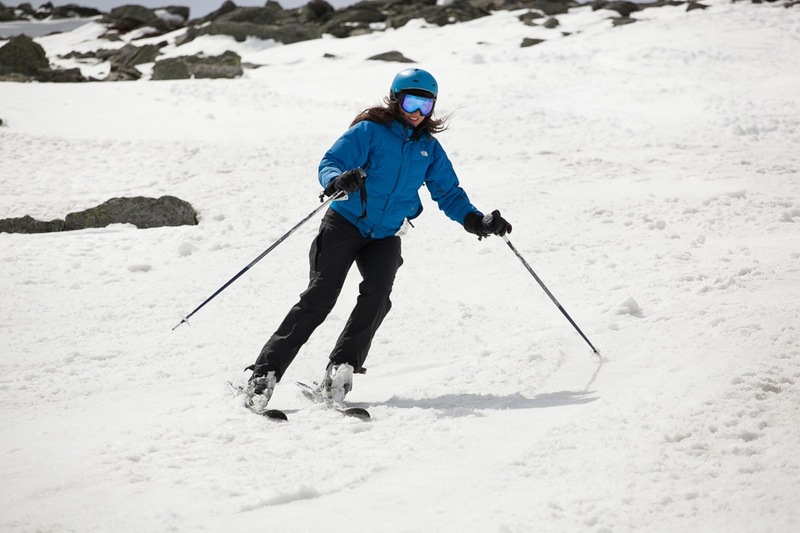 Nothing beats skiing a steep line with the confidence of a full season of practice. I’d have to say that with those elements in place the day was a success for all the members of our party. Just the fact that you were able to get your girl motivated to gear up at the end of May is impressive! I had a hard time motivating the family in mid April. Thanks for sharing. Great job getting everyone to go and back safe. My first trip to Big George was this spring and I just loved it. I hope to spend Easter week there next year with my daughter, hike’n and huck’n. nice ML, great pic of VTF also. Mt. Washington what a great place. 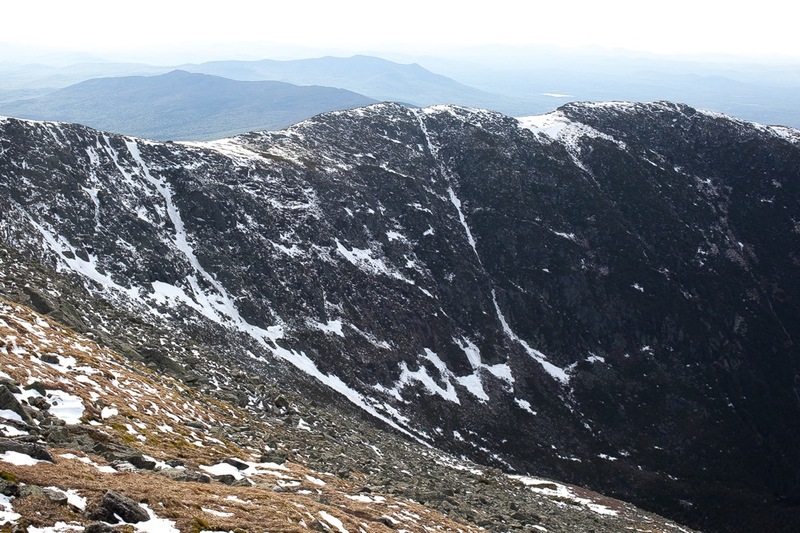 I’ve skied Tuckerman Ravine a few times. A two and a half hour hike with a fifty pound pack till we reached the snow !! what fun!! brings back great memories. Oh yea it’s Steep!! I love this site. Keep up the great work!! and keep them pointed down hill. ML, you’ve had a nice season. WV, CO, NY, VT, NH. What did I miss? Some nice milestones in there too. Go Amy! Thanx. Well written such that I felt as if I was there. It was a great season, Harvey. 2013 in particular, because the fall portion was not great unless you prefer hot water to snow. Hopefully we can pick it up right where we left off. How great would it be to ski the Slides by XMAS?!?! Ski bowl glades by Thanksgiving? I’d give thanks for that. Plattekill at Halloween? Yes, please. 2013-14 is looking up already.